Pvt. 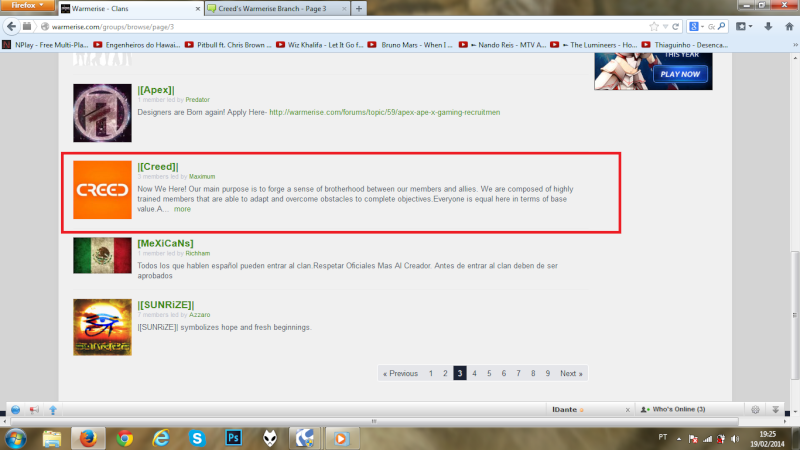 Ryan wrote: I have just posted our clan ad in the clan ad section of the Warmerise forum. I chatted with Max, and he added some of the tags we're using (like flash, spoiler, and center). Some of them are not up yet (like justify). I made a few changes from our original ad to the Warmerise one, such as adding the dates that we created this site and the Warmerise branch, and a notice at the bottom that people applying from Warmerise should apply here and go through the full recruitment process (right?). If you guys see something amiss in the Warmerise ad, let me know and I'll make the necessary adjustments. RickyNeuman wrote: If published my first xustom map on warmerise. I hope I can do that on Sunday, because I will be away the next 2 days. If you find any new bugs, please let me know. Is this some sort of bug? There were a few like that. RickyNeuman wrote: he got out of the map. I thought I fixed that, but it seems that i have to work on it again. BravoTango wrote: Wow, Ricky. That map looks awesome! Droidkiller1 wrote: A church in a quarry? Is that the hottest designing trend in Germany now-a-days? Anonymous wrote: Had a few games the other day, unfortunately only the Euro servers tend to be populated, leaving me with an unsatisfying 400+ ping. Woah! Definitely an improvement since last I played, but despite being an extremely competent amalgam of some of my favorite games (ps, tribes and quake franchises) the design and mechanics definitely leave something to be desired. Although I can't exactly participate as wholly as I'd like, due to ping and timezone differences, so my experience is somewhat lacking. Still, I don't enjoy the game that much. Salon? Like a beauty salon? Or a saloon, like a bar? ShadoWTigeR wrote: I registered yesterday and played a little in all the main maps and the maps made by Max (Our Max) and Ricky, and, I just can say that they did a really good job. Anonymous wrote: Yeah that one looks dope. RickyNeuman wrote: I have published my 4th map. Check it out, rate it and let me know if there are some bugs or if you (don't) like it. HanSolo wrote: Great maps Ricky! TRprotegido wrote: Looking that someone else that has posted here and i want to ask if someone already created the clan in warmerise again. because as everyone already know the game has been reseted and everything was deleted, all accounts and clans. So i'm starting to play it serious and i'm waiting to know when the Creed clan gonna be recreated in there. Max teabag wrote: TR I created a clan on there. Just send a request to join. TRprotegido wrote: I have no idea, but i know that the first is true. Max teabag wrote: Some kid that claims that I've made the fake creed. He wants my clan deleted. lol. Ludens wrote: Can we report him / the fake clan? Max teabag wrote: Yeah I reported him. People told me to wait for the new clan system where there wouldn't be any fakes. TRprotegido wrote: That's good, great job Max! lol Creed and Friends. I laughed. Fortius wrote: lol Creed and Friends. I laughed.